Some old timers say, “This time of year, if you sit very, very still, you can hear things grow in the Big Thicket.” This subtropical meeting place for people, plants, and wildlife, less than two hours from Houston, is famous for its biodiversity. 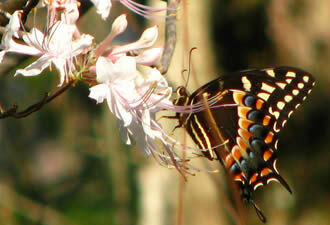 The observant visitor can find something new at every turn, especially in the spring. You will marvel at wildflowers, dogwoods, and plums that make bold splashes of color and lacy curtains of white on your way to the visitor center. 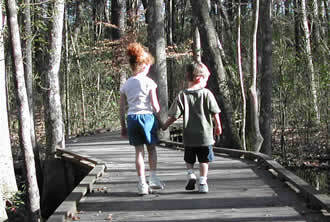 Explore the secrets of Big Thicket habitats in the amazing hands-on exhibits and meet the neighbors in a short film. Be sure to get a Junior Ranger booklet for the children. Grab a map and chart your course. Rangers are glad to help. Have you ever seen a carnivorous plant? The Sundew and Pitcher Plant trails are short strolls into the flower-strewn savannahs where the pitcher plants are in bloom alongside spring orchids. The sundew doesn’t bloom until June, but you can spot its dainty rosettes among the grass. The other two carnivorous plants of the thicket, bladderwort and butterwort, are somewhat elusive but certainly worth looking for. Got a stroller or wheelchair? No problem, both trails are accessible. Looking for more varied habitats? Trails up to 18 miles long will take you into dark, mysterious baygalls; sparkling cypress sloughs; and forests in shades of green from across the continent. Thinking of bringing your bike or your horse? The Big Sandy Trail is the one for you. Whether you have just a couple of hours or want to camp in the backcountry, you can experience the rebirth of spring rambling in the Big Thicket. Perhaps you would rather paddle? Slide in solitude on placid streams for an afternoon or a week. The Neches River and Village Creek meander for miles, sandbars shining in the sun, welcoming stops along the way. 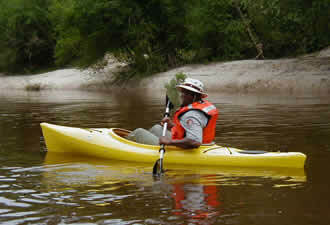 Rangers and local outfitters will help you choose the perfect paddling experience. The Cardinal Cruise is an excellent way to explore the river and backwaters near Beaumont. No paddling is required on Lamar University’s pontoon boat. In the spring, it seems you can find something new blooming every day! Of course, the migratory birds and butterflies show up at just the right time for their favorite feast, contributing their brilliance to the colorful canvas. Look for birding hot spots and add to your life list! And don’t forget your camera! Even professional photographers find an abundance of beauty to capture, usually close-up and personal. The microcosms within Big Thicket and their interrelationships attract and engage scientists from around the world. Over 105,000 acres; 10 distinct ecosystems; more than 1,000 flowering plants; 85 tree species; and at least 186 bird and 50 reptile species are protected at Big Thicket National Preserve. Rangers conduct free guided programs on weekends. Join us for an insider look at the spring secrets of the “big woods” of southeast Texas; there is no better time to visit Big Thicket National Preserve.